Our 10 Step Blueprint for Animating Kids! (Note: This is an epic post. (close to 3,000 words plus several videos) Please print, bookmark or flag this post for careful consideration - this is an outline summary of the Animation Chefs' video course in the Blue Hat level of our Animating Kids paid members area. Of course we would love you to be a subscriber, but this process needs to get out to as many media mentors as possible - please share this URL with anyone who has interest in helping kids learn the language of digital storytelling with sound and motion. This is the step-by-step process we use to teach kids animated film-making before they leave elementary school. If you've followed our mission and vision so far, you know we think kids should be taught the language of sound and motion as if it were their native tongue. Kids are excited to participate in the media revolution in which wfind ourselves. It animates their souls! Check out this unsolicited short clip from a parent's cell phone at a recent screening of 4th Grade animations. I'm the Joe in the clip. More on me here. That is how "animated" kids are about making their own animated stories! We've bottled up the blueprint below so you can capture this excitement with your your young media mentees. Step 1. Brainstorm an interesting character with a problem to solve. Invent a compelling story and kids get animated! If you invent a basic character with an almost unsolvable problem, you will have an interesting story idea which will become the engine of productivity, teamwork, and excitement during this whole process. If you want to develop a story from scratch, try this: generate a list of characters, settings and problems. Take 15 minutes to brainstorm at least two dozen ideas. Work in a small group and give each participant a chance to mix in multiple characters, settings, and problems. The more the merrier. Once you've brainstormed a list, an idea or two will jump out as a great possibility. Vote for your favorite. Don't go for the solution to the character's problem yet, that will come later. Decide on an interesting character with a big-fat-juicy-interesting problem. What if the animation is an assignment, like explaining the water-cycle? Make a water droplet the main character. Give it a problem. Maybe it is afraid of heights? Maybe it fears evaporating? Maybe it is in love with another droplet? Go for a big fat juicy problem no matter the subject. Make a central character and give it issues! If you can agree on an interesting story starter, the animation will almost make itself! In our experience a 10 picture storyboard sequence averages out to about a one minute movie. A one minute animation is our desired outcome for this blueprint. Below is an example of a storyboard from our Blue Hat level. The storyboard above is about a remote control that falls into the interior of a sofa. An exclusive video of the process is below. So begin by drawing a 10 picture storyboard with basic stick-figures, non-artistic sketches of scene ideas. Use Long shots, Medium shots and Close-ups (See "Framing the Shots below) Use a piece of paper or 3X5 cards. How to proceed? Sketch an opening scene and ask, "What happens next?" Then quick-sketch that idea in scene 2 and decide whether it needs to be a long shot, medium shot or close-up. Then ask, "What happens next?". Rinse and repeat until you've filled in 10 scenes. Deciding what happens from scene to scene will force a solution to the problem by scene 10. Use pencil! This is a living blueprint of your story and it will change. Step 2a. Framing the Shots. In the storyboard image above, notice the letters L, M, and C.U. above each scene? This indicates whether the scene is a Long shot, a Medium shot, or a Close-Up. This is a very powerful concept and a fundamental step in acquiring the language skills of film-making. This is how we keep people's eyeballs engaged enough to show them the story. Camera angles are a character in your movie too. They have everything to do with focusing your audience's eyeballs on what is important. Long shots are used to show settings or size differences. Imagining the camera's point-of-view (POV) being a "long" way away. This is a way to remember why Long shots are used. Medium shots are great to show characters speaking, head-to-toe shots of costuming, and important body-sized gestures or poses. Close-ups are great for emotional reactions, small objects and small details. Above is a random list of ideas we generated for a movie idea about a remote control that falls deep in a sofa. It is a messy list of T.V. terms, button language, and a whole lot of other nonsense. We are looking for puns, idioms, and word play cleverness around this basic movie idea. Be silly and remember there are no right answers. Fling ideas like spaghetti-at-the-wall, and we'll find out what sticks later. There is no such thing as a bad idea in brainstorming! Fill a page with your random ideas and then set it aside. We will revisit during Step 8. Our bias is to use cut-paper for beginning stop motion storytelling. 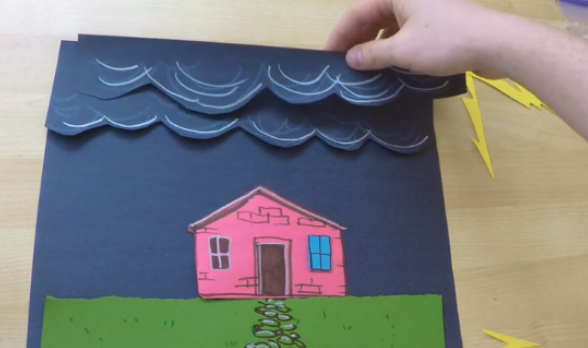 Cut-paper animation is the fastest, easiest way to make an original animation. Markers, pencils, crayons, paper, tape and scissors are all you need to bring entire creative worlds to life. We sometimes throw clay into the mix too, but in a very limited, flattened-for-the-table-top, sense. Designs with hand-made paper cut-outs and drawing utensils make the final product a truly unique and rewarding blend of technology and hand crafted goodness. Legos, pose-able toys, upright claymation, and 3D computer animation come later, but flat paper on a table top trumps everything for speed, ease of use, hand's on training, and maintaining creative control. Prep your scenes for animation. The Long shot above is being composed on 8.5" X 11" black construction paper, with the non-animated props taped down with loops of masking tape. Your movie has three different kinds of shots: Long, Medium, and Close-Ups. Yet you only have one size of movie screen - 8.5 X 11". So, you may have to make three different sizes of your main character. ...a Medium Shot version, and a Long shot version so the character is small enough to fit in a far away POV. Getting the size right is one of the biggest challenges in this process. So take time to think this through with your young filmmakers. Use the Rule of Thirds as a guide for composing a scene. When two characters share the scene, put one on the right 1/3 and one on the left 1/3. Arrange the ground or a floor on the bottom 1/3 of the scene. This way your characters have something to stand on. Hypothesize the time duration of each scene and predict how many pictures the animation may require based on a 15 F.P.S. frame rate. Stand up and physically act out each scene! This movie has never been made before - by anyone. Let's predict how long it takes to perform by...performing it! This is a great estimation exercise. 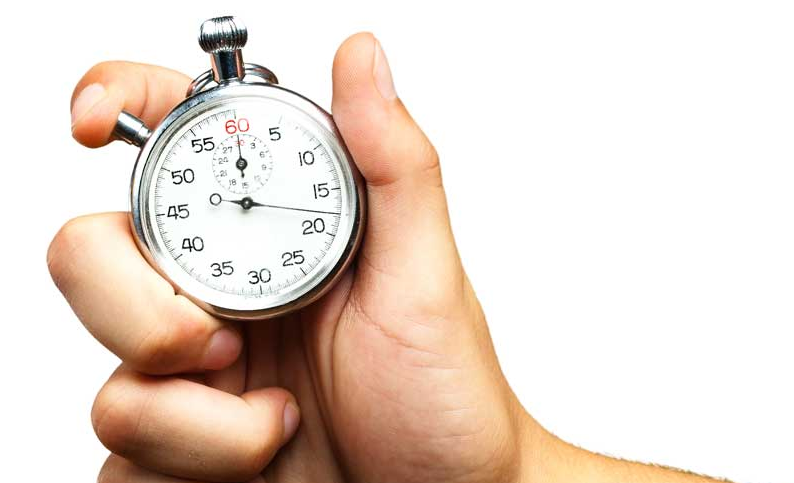 The time estimations are usually way off, until someone physically acts out the scene with a stop watch. If a scene takes 6 seconds to act out, and we work at 15 frames per second, it will take 90 pictures to animate this scene: 6sec X 15 fps = 90 pictures. Do the math. Plan the motion. Time it out. Do this for every scene. We believe, in some strange osmosis-kind-of-way, that acting out the scene translates to better animation skill acquisition. New animators will absorb the story kinesthetically by acting it out. Our experience is that new animators work too fast, draw too small and haven't a clue the timing of scwnwa oe about placement of props. Use th S. L. T. acronym to remind them to take time planning out the size, the layout and time signature of each scene. Working in cut paper creates a lot of props. It makes a big difference to organize the scenes into baggies when you finish creating them. Then when it comes time to animate each scene, empty the scene's contents from the baggie onto the table. Viola'! Ready to go! All the basic animation formulas, vocabulary, and principles of animation are demonstrated in detail if you subscribe to the paid membership at Animating Kids! We spent 3 years working out how to teach animation concepts in the easiest, fastest way. If you want to dive deep and have hours worth animation instruction - subscribe. But! Your free recipes and an interesting character/setting/problem story idea will take you a long way. Armed with this blueprint you can get a it done without subscribing. Each scene will present opportunities to use the animation concepts in your free recipes on the basics: Speeding-up & Slowing down, Bouncing Ball with Squash & Stretch, Wind-up and Follow through, and Lip-syncing. Animate one scene at a time, in order. Then save it as a silent movie. Animating all 10 scenes will take somewhere between 2-3 hours all in. Sometimes less, sometimes more, depending on preparation. We've split it up into 26 sessions, 12 sessions, 6 sessions, or 1 day sessions. Bottom line, get everything ready to be animated and you'll be able to budget your time accordingly. Remember that list of word play, puns, idioms, and acronyms from Step 3? This list has incubated and stewed for some time. These brainstormed words will inform what dialogue is best for the voice-over sessions. Get the list out. Review it. Note which scenes on your storyboard have opportunities for speaking parts. Use your original ideas and come up with some new ideas as well. We do our final dialogue writing AFTER the scenes are animated because because we know our story much better. We see our characters move. We see their poses. We see their faces. They are alive! We have a sense of the flux and flow of the whole movie. Watch the video snippet below as the Animation Chefs use their original list to come up with possible dialogue for a terrified remote control deep inside a sofa. These dialogue ideas are the life blood of short animation. Words and the way we act them out will be one of the most important reasons a movie succeeds. Beautiful animation can be dragged down by poor dialogue, but poor animation can be saved by voice acting when the words are carefully chosen. An editing app or software is required for this step. Apple's iMovie, Google's WeVideo, and Adobe Premiere Clip are good solutions for iOS and Android tablets, Google Chromebooks and smartphones. There are other options, but we have used these. Import all your silent animated scenes into the editing app. Drag them into the timeline according to the storyboard sequence you have mapped out. A "pass" is where you go through the entire movie with one goal in mind. 1. Do a voice pass first. Go through and record all the VO's first. You'll record a line of dialogue and copy and paste the lip-sync loop animations to fit the length of the voice recording. Additionally, as you do this you will also trim the clips of any animation mistakes, shadows, fingers, and unfinished bits. This was the reason for your 4th free recipe. Review it if you forgot how it works. This is one of the most powerful and flexible ways to make the voices happen. This saves a lot of time and allows us to improvise without having to re-animate. This is where epiphanies happen. So first, do all the VOs in one "pass". Front to back. This sets duration for the movie too. Once the voices are done, most of the timing issues are taken care of. 2. Record the sound effects (SFX) in another "pass". Our favorite sound effects production tools are kid's mouths and a piece of paper. We use our mouths for 90% percent of our SFX. Paper is good for crunchy sounds like footsteps, fire, impacts, and bunch of other cool effects. 3. Do the music "pass" last. This is last because we know how long the movie is, and we can shrink or extend a music score to fit. We often encourage kids to sing their own scores, or you can use garageband or a favorite sound app to mix the music. Following the "pass" method is a great way to stay organized and save time during post-production. Below is a clip of how the Animation Chefs implement VO and SFX for a scene where the remote control freaks out. They record the line they just invented for this scene. Check out one scene's VO and SFX passes. Post-production by far the most rewarding phase of making a movie. Doing voices for characters and creating SFX for the action creates a buzz of energy difficult to describe until you go through the process. 4th Graders at a recent premiere of their animated films in NY @ the Burns Film Center. If you don't have a school auditorium or local screen willing to show your work, celebrate the world premiere of these animations on social media, Youtube, on a smart board in class or at family gatherings...where ever you can. It reprograms kid's sense of themselves as a digital citizen, and a participant in their media making culture. Following these 10 steps can guide young media enthusiasts in the process of making a meaningful animated story from scratch - without any prior experience. Please send us a link to any of your finished masterpieces, and we'll share it with the world! PS If you want to get serious about drilling down into each step, with hours worth of streaming video demonstrations, modeling each step, including the downloadable worksheets, subscribe to our All Hats level. Not necessary, but truly the next step to mastery.